For example, for a list of TDeveloper objects you would need developers (instances of TDeveloper) sorted, in the list, by their name, knowledge or salary – or any other property. That’s boring! I want my lists randomized! 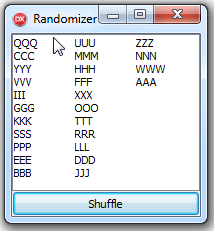 What if you need to randomize the position of elements in a list? Is there an “UnSort” method you can use? Is there a “Randomize” method in TStrings (or similar)? No. Imagine a deck of cards. Yes, you see it now. How funny the game would be if you would always know what cards are on top of the deck. That’s it. Call the Sort method by specifying a comparer that would randomly set if an element is less than or greater than the compared element. This looks lovely, but if you have different lists of different objects that you want to have shuffled, you might want to have a more simple way to call the “unsort” code. Here’s a dummy example where a list of letters is displayed in a list box (“ListBox1”), then shuffled and displayed again. This is not guaranteed by that random comparer. @Uwe, I’m not sure I understand what are you not sure of, but the presented UnSort method works as expected – it randomly rearranges the elements of a list. I think Uwe is right. Quicksort (probably any sort) depends on the fact that the results of a comparison are always the same and consistent. Using a random result certainly does something, but I doubt it shuffles properly. I’m not certain what would be “properly” in terms of shuffling, but if the (integer) list has items 1,2,3,4,5 and after calling UnSort the order is 4,2,5,3,1 and after calling again the order is 2,1,5,3,4 (and so on), that’s good enough for me. The bigger strike against the Unsort method is going to be the performance characteristics. They’re going to be very uneven since the Comparer is returning random results — almost certainly worse on average than a normal quicksort. I’m still worried about the quicksort implementation getting into some very strange states with a random comparer as well. I should have reviewed my other open tabs before commenting. A properly implemented quicksort should be fine, other common sorting algorithms might perform slightly worse, but not degenerate significantly. Except bubble sort. @Tony: great discussion, thanks for the link. Yes, the (Fisher-Yates) Shuffle implementation can stop at -2, but -1 feels more natural even though the last step makes no sense. Why not use the simple Satolo cycle to unsort?